"Snake goddess" is a type of figurine depicting a woman holding a snake in each hand, as were found in Minoan archaeological sites in Crete. The first two of such figurines (both incomplete) were found by the British archaeologist Arthur Evans and date to the neo-palatial period of Minoan civilization, c. 1700–1450 BCE. It was Evans who called the larger of his pair of figurines a "Snake Goddess", the smaller a "Snake Priestess"; since then, it has been debated whether Evans was right, or whether both figurines depict priestesses, or both depict the same deity or distinct deities. The figurines were found only in house sanctuaries, where the figurine appears as "the goddess of the household", and they are probably (according to Burkert) related to the Paleolithic traditions regarding women and domesticity. The figurines have also been interpreted as showing a mistress of animals-type goddess and as a precursor to Athena Parthenos, who is also associated with snakes. 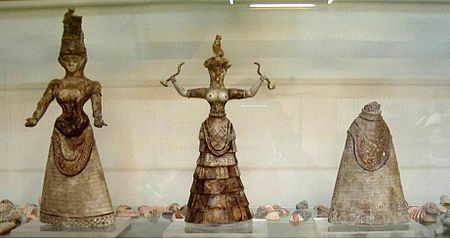 The first two snake goddess figurines to be discovered were found by Arthur Evans in 1903, in the temple repositories of Knossos. The figurines are made of faience, a technique for glazing earthenware and other ceramic vessels by using a quartz paste. After firing, this produces bright colors and a lustrous sheen. This material symbolized the renewal of life in old Egypt, therefore it was used in the funeral cult and in the sanctuaries. In particular, one of the "snake goddesses" was found in a few scattered pieces, and was later filled with a solution of paraffin to preserve it from further damage. The goddess is depicted just as in other statues (crown on head, hands grasping snakes etc.). The expression on her face is described as lifelike, and is also wearing the typical Minoan dress. Another figure found in Berlin, made of bronze, looks more like a snake charmer with the snakes on top of her head. Many Minoan statues and statuettes seem to express a pride. The serpent is often symbolically associated with the renewal of life because it sheds its skin periodically. A similar belief existed in the ancient Mesopotamians and Semites, and appears also in Hindu mythology. The Pelasgian myth of creation refers to snakes as the reborn dead. However, Martin P. Nilsson noticed that in the Minoan religion the snake was the protector of the house, as it later appears also in Greek religion. Among the Greek Dionysiac cult it signified wisdom and was the symbol of fertility. Barry Powell suggested that the "snake goddess" reduced in legend into a folklore heroine was Ariadne (whose name might mean "utterly pure" or "the very holy one"), who is often depicted surrounded by Maenads and satyrs. Some scholars relate the snake goddess with the Phoenician Astarte (virgin daughter). She was the goddess of fertility and sexuality and her worship was connected with an orgiastic cult. Her temples were decorated with serpentine motifs. In a related Greek myth Europa, who is sometimes identified with Astarte in ancient sources, was a Phoenician princess whom Zeus abducted and carried to Crete. Evans tentatively linked the snake goddess with the Egyptian snake goddess Wadjet but did not pursue this connection. Statuettes similar to the "snake goddess" type identified as "priest of Wadjet" and "magician" were found in Egypt. Both goddesses have a knot with a projecting looped cord between their breasts. Evans noticed that these are analogous to the sacral knot, his name for a knot with a loop of fabric above and sometimes fringed ends hanging down below. Numerous such symbols in ivory, faience, painted in frescoes or engraved in seals sometimes combined with the symbol of the double-edged axe or labrys which was the most important Minoan religious symbol. Such symbols were found in Minoan and Mycenaean sites. It is believed that the sacral knot was the symbol of holiness on human figures or cult-objects. Its combination with the double-axe can be compared with the Egyptian ankh (eternal life), or with the tyet (welfare/life) a symbol of Isis (the knot of Isis). Wadjet had a famous oracle in the city Per-Wadjet (Greek name Buto). According to Herodotus this may have been the source of the oracular tradition which spread to Greece from Egypt. The serpents were considered the protectors of the temples and the chthonic masters of the ancient earth goddess. In Greece the old oracles were devoted to the mother goddess. The ancient Egyptian goddess Renenutet, who often appeared in the form of a hooded cobra. The Phoenician goddess Tanit, worshipped as a patron goddess of Carthage. The Indian snake goddess Manasa, literally meaning "of the mind", or "conceived in the mind", or "power of the mind" is the tutelary deity of snakes and fertility, worshipped mainly in Bengal and the eastern parts of India. Diktynna, also known as the Cretan "Mistress of the Wild", is a possible variant. The feminist artwork The Dinner Party by Judy Chicago features a place setting for a "Snake Goddess". ^ a b Ogden, Daniel (2013). Drakon: Dragon Myth and Serpent Cult in the Greek and Roman Worlds. Oxford University Press. pp. 7–9. ^ Bonney, Emily M. "Disarming the Snake Goddess: a Reconsideration of the Faience Figurines from the Temple Repositories at Knossos." Journal of Mediterranean Archaeology, 24.2 (2011): 171-190. ^ F. Schachermeyer. Die Minoische Kultur des alten Kreta. W. Kohlhammer Verlag, Stuttgart 1964, p. 143. ^ a b L. D. C. "A Statuette of the Minoan Snake Goddess. Gift of Mrs. W. Scott Fitz." Museum of Fine Arts Bulletin, Vol. 12, No. 73 (Dec., 1914), pp. 51–55 (online). ^ Harald Haarmann: Das Rätsel der Donauzivilisation. Die Entdeckung der ältesten Hochkultur Europas, Verlag C. H. Beck, Munich, 2011, p. 241, ISBN 978-3-406-62210-6. ^ F. Schachermeyer: Die Minoische Kultur des alten Kreta, W.Kohlhammer, Stuttgart 1964, pp. 256, 263. ^ Zeus Kresios in the guise of a snake is regarded the "protector of storehouses". A snake is the "good daemon" at the temple of Athena on Acropolis, etc. : Martin Nilsson: Die Geschichte der griechischen Religion . Vol. 1. C. H. Beck Verlag, Munich 1967. ^ Barry Powell. Classical Myth, with new translations of ancient texts by Herbert M. Howe. Prentice Hall Inc., Upper Saddle River (New Jersey) 1998, p. 368. ^ H. G. Wunderlich: The secret of Crete. Efstathiadis group S.A., 1994, pp. 260, 276, ISBN 960-226-261-3 (First British edition, published 1975 by Souvenir Press Ltd., London). ^ Lucian of Samosata (200 AD): De Dea Syria 4. ^ Cristopher L. C. E. Whitcombe: Minoan Snake Goddess". 8: Snakes, Egypt, Magic and women (external links). ^ F. Schachermeyer: Die minoische Kultur des alten Kreta. W. Kohlhammer Verlag, Stuttgart 1964, pp. 161, 163. ^ F. Schachermeyer: Die Minoische Kultur des alten Kreta. W. Kohlhammer Verlag, Stuttgart 1964, p. 163 f.
^ Cristopher L. C. E. Whitkombe: Minoan snake goddess. 9: Snake charmers (external links). ^ Herodotus.Histories II, 55, and VII, 134. Wikimedia Commons has media related to Snake Goddess. This page was last edited on 30 March 2019, at 15:06 (UTC).